Ideally, the best way to treat a disease is to not get it in the first place. That's why we put ourselves through check-ups, vaccines, and keep an eye on our personal habits. But some states are better at this preventative care than others. In a new America's Health Rankings report from the United Health Foundation, a nonprofit that focuses on improving healthcare, the group outlines the states with the best — and the worst — preventative care. 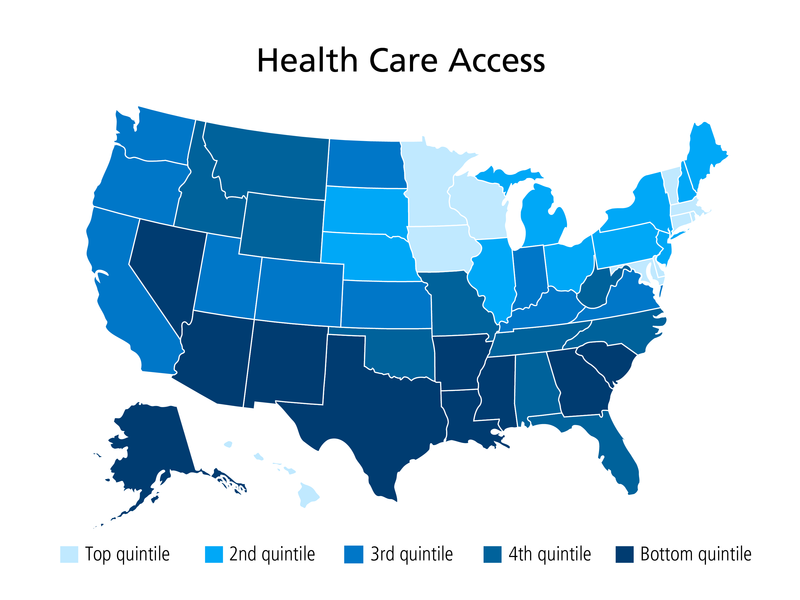 Access to healthcare, measured by the percentage of adults who had healthcare coverage, annual dental visits and a personal doctor. Access to chronic disease prevention methods, measured by the percentage of adults who had their cholesterol checked, had a colorectal cancer screening or were told they had high blood pressure. The data for the report was gathered from government reports including Behavioral Risk Factor Surveillance System reports, the 2014 National Immunization Survey and other published studies. Massachusetts outshone every other state in terms of preventing chronic disease and providing the best access to healthcare. Mississippi, on the other had, ranked far below the national average in both these arenas and more. Beyond ranking all 50 states, the report also broke out the three components, with the lightest color indicating the states that were doing the best in a particular arena. For the most part, there wasn't much variability among the three metrics, with many states falling consistently in the same category. 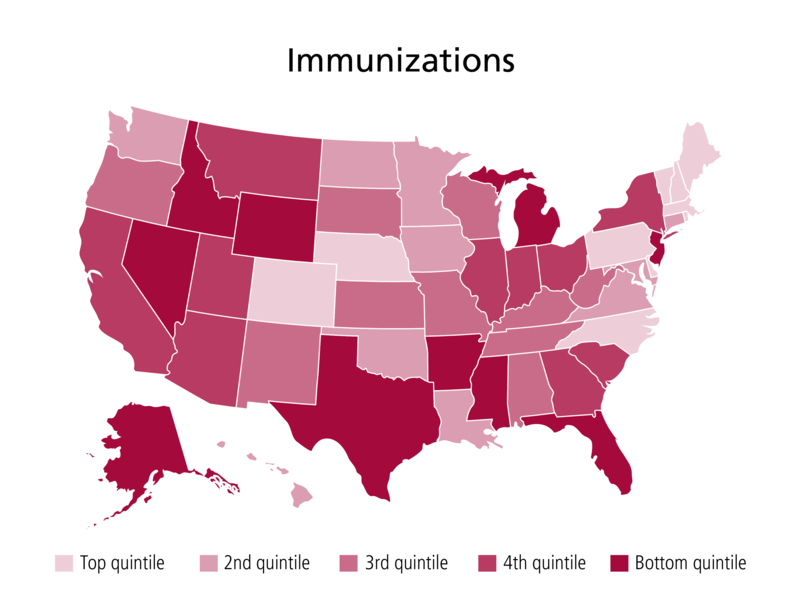 And immunizations: United Health FoundationNotably, South Dakota did the best job of getting adults to get flu shots, while North Carolina and Rhode Island were the best at vaccinating women and men, respectively, for human papillomavirus, a sexually transmitted infection that can lead to cancer. Rhode Island is one of only a handful of states to mandate the HPV vaccine, which has been controversial because of concerns that it will promote teen promiscuity. 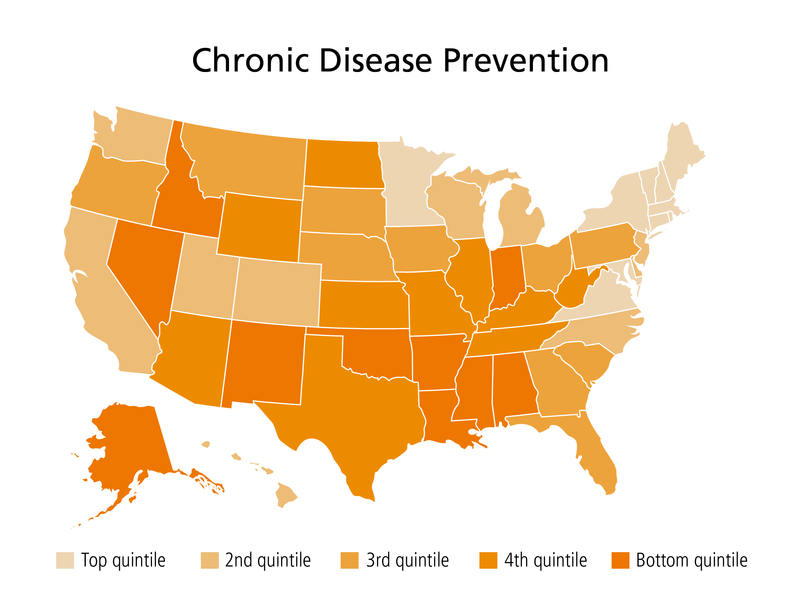 Apart from Utah, which ranked the highest in preventing high blood pressure, Massachusetts managed to outshine the other 49 states in its chronic disease (characterized as lasting more than three months) prevention efforts.